This week, Edgar Allan Poe's mysterious birthday visitor did not show up at the beloved writer's grave. "I'm confused, befuddled," said Jeff Jerome, curator of the Poe House and Museum in Baltimore, according to the Associated Press. 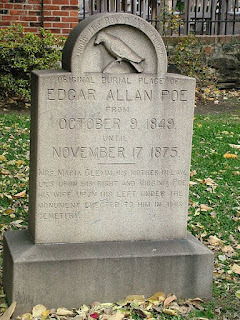 The "Poe toaster" has been a true life literary mystery and tradition since 1949, the first time an unidentified figure entered the Westminster Hall and Burying Ground in Baltimore, Maryland, in the early hours of Poe's birthday to leave a half empty bottle of cognac at the writer's grave. Throughout the years, the unidentified (and allegedly male) person has been described as dressed all in black, with a white scarf and carrying a silver tipped cane. The event, in which the figure toasts the "Annabel Lee" scribe before leaving, has drawn small crowds in recent years. The toaster has also left several notes over the years. In 1999, the noted stated that the original toaster had passed away, and that he had left the duty to "a son." The new toaster's notes have generated some controversy in recent years. In 2001, the note appeared to favor the New York Giants over the Baltimore Ravens in the NFL's Superbowl; a puzzling development being that the Baltimore football team owes its namesake to poet and his poem. And in 2004, the toaster used anti-French sentiments in his note, likely due to French opposition to the war in Iraq, by saying that "The sacred memory of Poe and his final resting place is no place for French cognac." Two years after the anti-French note, a group of people entered the graveyard in an attempt to accost and out the toaster, as they believed the tradition tainted by the controversial notes. Last year, The Baltimore Sun described the crowd gathered to watch the event as significantly smaller than years past, and the toaster left no note. This year, for the first time in six decades, the toaster made no appearance at all. No doubt the son wasn't into the tradition his father was. Unless something happened. Thanks for posting this. I have always wanted to go down and watch the event sometime; it's sad to think that its future is in doubt. Surely, someone out there must want to carry the torch!